Chances are, when you hear the term ‘Asbestos’ you DON’T think of a rock – but that’s exactly what it is! Asbestos is a natural occurring serpentine rock that contains silicon, water and magnesium. It has been mined and used for centuries because of its durability to heat, electricity and chemical resistance. Asbestos can be pulled into a fluffy consistency, with fibers that are soft and flexible, and in proportion to their weight – stronger than steel! Asbestos has been used for over 2000 years, with the early Greeks using Asbestos for lamp wicks. In fact, the term ‘Asbestos’ derives from the Ancient Greek “in-extinguishable”. The Romans and Egyptians used Asbestos in fabrics because it was so durable and fire resistant. Long considered a “miracle” mineral, asbestos has been utilized in thousands of products, in everything from insulation and other construction materials to car brakes and hair dryers. Pure asbestos is an effective insulator, and it can also be mixed into cloth, paper, cement, plastic and other materials to make them stronger. At the height of its use, asbestos could be found in over 3,000 consumer products. During WWII, the United States experienced an Asbestos Boom, with asbestos being used to build ships, submarines and even airplanes! As we mentioned earlier, asbestos is extremely heat resistant, and does not break down easily when exposed to chemicals, thus making it a seemingly perfect production material! Shortly following WWII, in 1945, Asbestos took a turn to construction with the post war construction boom. Asbestos could be found in almost all building materials – from roofing shingles to vinyl tile flooring and literally everywhere in between. Although its use has diminished in recent decades, there are still many products that contain asbestos, especially in older homes, schools, and public buildings. It wasn’t until the late 50’s that people started to notice that factory workers, soldiers, ship builders and construction workers (pretty much everyone who had had prolonged exposure to asbestos) started to show signs of serious sickness. Over time, researchers realized that when asbestos materials are disturbed or damaged, asbestos fibers can be released into the air and cause dangerous exposure. When people accidentally inhale or ingest the microscopic fibers, the mineral can get lodged in the lining of the lungs, esophagus and even the digestional track, eventually leading to serious health problems. Asbestos is perhaps best known for its role in causing mesothelioma, a rare and deadly cancer that can develop in linings of the lungs, abdomen, or heart. Microscopic asbestos fibers cannot be seen, smelled or tasted, and asbestos exposure does not cause any immediate symptoms, so it is easy for a person to inhale or swallow asbestos dust without realizing it. Once asbestos fibers are in the body, they never dissolve, and the body has extreme difficulty expelling them. Over years of time, trapped asbestos fibers can cause inflammation, scarring and eventually genetic damage to the body’s cells. Asbestos exposure can take from 10 to 40 years to develop signs. Asbestos was used in thousands of commercial products and industrial capacities and those working with the material in these industries are potentially at risk of harmful exposure. Although the use of asbestos in the United States was halted in the late 1970s, with just a few exceptions, this toxic mineral has continued to have an impact on the country during the last few decades. The lives of many individuals have been adversely affected by previous asbestos exposure and this mineral can still be found throughout the country, particularly in old homes, factories, and commercial buildings. Many American buildings constructed before 1980 contain asbestos, and asbestos-containing materials come in many forms. Construction materials containing asbestos were used for centuries before researchers began to link the mineral’s fibers with serious health risks, like asbestosis and mesothelioma. If you live or work in a building built before 1980, chances are that asbestos can be found in some part of the building, whether in the roof shingles, the insulation, an old furnace, or elsewhere. Products today can be made with asbestos as long as it accounts for less than 1 percent of the product. Current products include brake pads, automobile clutches, roofing materials, vinyl tile, cement piping, corrugated sheeting, home insulation and some potting soils. There are two ways to safely deal with Asbestos. 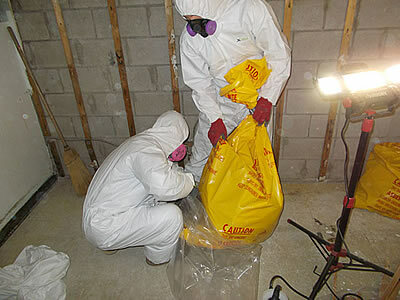 The first is ‘abatement’ – which means complete removal of the materials containing Asbestos. The second method is ‘Encapsulation’ – fully covering and sealing off Asbestos materials. A certified asbestos inspector will perform a visual inspection of the home, and take several samples of any suspected materials to be tested. An asbestos inspector can make recommendations for how to correct the situation or prevent damage to any so far undisturbed asbestos. Asbestos is only a problem once it is disturbed – during renovations, when damages occur to a home etc… The inspector will make the decision to If abatement or encapsulation are necessary. Before any work actually begins, you will receive a written contract that details the removal plans, including cleanup and will also include an explanation of all the federal, state and local regulations we must abide by. As the removal or encapsulation starts, the site will be clearly marked as a hazardous area. The area will then be completely sealed off from the rest of the house with plastic sheets. No household occupants, including pets, will be allowed in or around the area. The HVAC system will be shut off to avoid any fibers from potentially spreading to other rooms. When Asbestos breaks, fibers are released into the air. For this reason, Workers should never break any removed materials into smaller pieces for easier cleanup. All asbestos materials should actually be wet down during removal and cleanup, as that keeps any loose fibers from spreading or becoming airborne. house. The area should be thoroughly cleaned with wet mops and rags and only HEPA vacuums, as regular vacuums could spread any lingering asbestos dust. Upon completion, you should receive another written record that explains the work that was done and that proper procedures were followed. Asbestos can still be found in a myriad of homes, schools, industrial and commercial buildings. US Navy veterans who served during World War II and the Korean Conflict have the highest incidence of these diseases. 10,000 Americans will die this year from Asbestos-related Diseases. 200,000 people are currently living with asbestosis. If You Are Worried That You May Have Asbestos In Your Home, Call Our Certified Experts 24/7 at 910-426-4956!